The town of Clare is located in South Australia in the Mid North region, 136 km north of Adelaide. 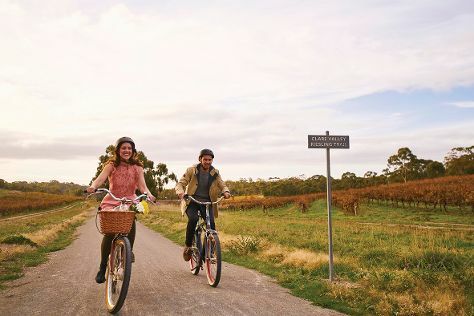 On the 29th (Sun), grab your bike and head to Gleeson Wetlands, appreciate the views at Clare Valley, and then hike along Riesling Trail. For reviews, traveler tips, photos, and other tourist information, refer to the Clare trip planner . Prague, Czech Republic to Clare is an approximately 27-hour flight. You'll lose 8 hours traveling from Prague to Clare due to the time zone difference. 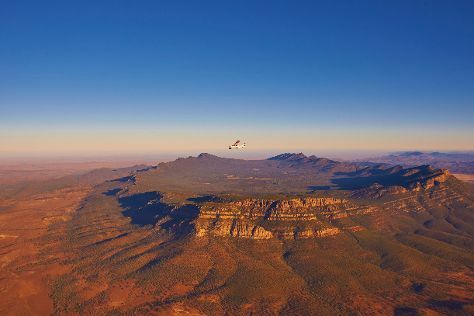 Cap off your sightseeing on the 29th (Sun) early enough to travel to Flinders Ranges National Park. On the 30th (Mon), hike along Brachina Gorge Geological Trail and then take in the dramatic natural features at Bunyeroo Gorge. Get ready for a full day of sightseeing on the 1st (Tue): don't miss a visit to Bridle Gap, then take in the dramatic natural features at Wilpena Pound, and then explore the different monuments and memorials at Kanyaka Ruins & Cemetery. To find traveler tips, ratings, and tourist information, refer to the Flinders Ranges National Park trip planner . Drive from Clare to Flinders Ranges National Park in 4 hours. Expect a daytime high around 26°C in September, and nighttime lows around 10°C. Cap off your sightseeing on the 1st (Tue) early enough to travel to Coober Pedy. Kick off your visit on the 2nd (Wed): admire nature's extreme beauty at Breakaways Conservation Park, then admire all the interesting features of Tom's Working Opal Mine, then pause for some serene contemplation at Serbian Orthodox Church, and finally look for gifts at Opalios. Get ready for a full day of sightseeing on the 3rd (Thu): look for all kinds of wild species at Josephine's Gallery & Kangaroo Orphanage, then admire the striking features of Faye's Underground Home, then take in the architecture and atmosphere at Catacomb Church, and finally get engrossed in the history at Umoona Opal Mine & Museum. To see photos, more things to do, maps, and tourist information, use the Coober Pedy trip itinerary app . The Route module can help you plan travel from Flinders Ranges National Park to Coober Pedy. Expect a daytime high around 36°C in October, and nighttime lows around 18°C. Finish your sightseeing early on the 3rd (Thu) so you can travel to Port Lincoln. You'll discover tucked-away gems like Glen Forest Tourist Park and Food Tours. Get in touch with nature at Shark Diving and Winter Hill Lookout. Next up on the itinerary: look for all kinds of wild species at Mikkira Station, enjoy the sand and surf at Fishery Bay, and don't miss a visit to The Old Mill. To see photos, more things to do, ratings, and other tourist information, go to the Port Lincoln holiday builder tool . You can fly from Coober Pedy to Port Lincoln in 5 hours. Other options are to drive; or take a bus. Wrap up your sightseeing on the 6th (Sun) to allow time to travel to Kangaroo Island. 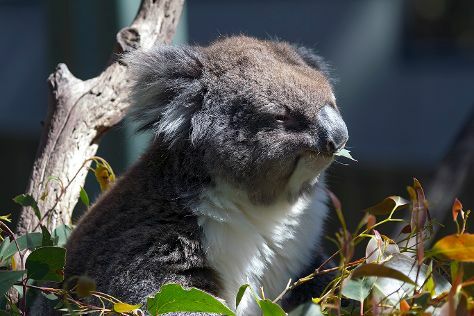 Get outdoors at Kelly Hill Caves and Kangaroo Island Wildlife Park. You'll explore the less-touristy side of things at Hanson Bay Wildlife Sanctuary and Little Sahara. There's still lots to do: enjoy the sand and surf at Stokes Beach, sample the fine beverages at Kangaroo Island Spirits, admire all the interesting features of Will's Rare Breeds Farm, and get a taste of life in the country at Island Pure Sheep Dairy. To see more things to do, photos, ratings, and more tourist information, go to the Kangaroo Island trip planner . Getting from Port Lincoln to Kangaroo Island by flight takes about 3 hours. Other options: do a combination of car and ferry; or do a combination of bus, ferry, and taxi. Finish up your sightseeing early on the 9th (Wed) so you can travel to Adelaide. Step off the beaten path and head to Gorge Wildlife Park and Stand-Up Paddleboarding. Take a break from the city and head to Aldinga Beach and Glenelg Beach. There's still lots to do: enjoy the sand and surf at Henley Beach, pause for some photo ops at The Rundle Mall Pigs, stop by Haigh's Chocolates Beehive Corner, and contemplate the long history of Adelaide Oval. For other places to visit, maps, photos, and more tourist information, refer to the Adelaide online vacation builder . Fly from Kangaroo Island to Adelaide in 2.5 hours. Alternatively, you can do a combination of car and ferry; or do a combination of taxi, ferry, and bus. October in Adelaide sees daily highs of 26°C and lows of 13°C at night. Finish up your sightseeing early on the 12th (Sat) so you can travel back home.